- As battered as the Serbian army is, it still has not lost all fighting spirit. 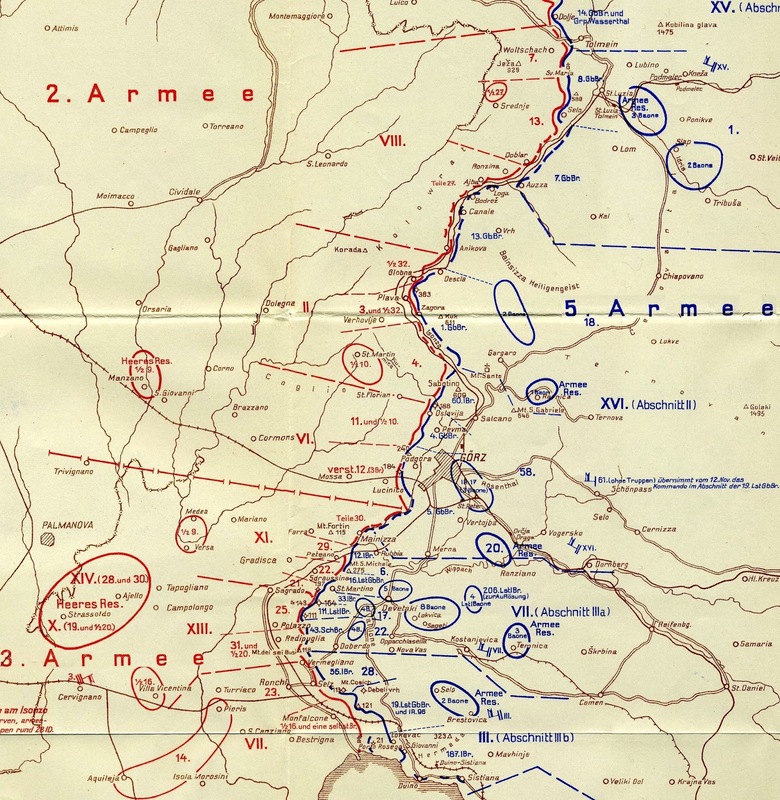 Today the Timok 1st, Sumidija 2nd, and Morava 2nd Divisions of the Serbian 2nd Army launch a counterattack against the Bulgarian 1st Division, forcing it back toward Leskovac. This gives 2nd Army breathing room to resume its retreat. - Though Cadorna had suspended the offensive of the Italian 2nd and 3rd Armies along the Isonzo River on the 4th, over the past five days Italian artillery has kept up a steady rate of fire on Austro-Hungarian lines, and there have been a number of small-scale attacks against specific points. Though these actions were designed to give the enemy no rest and no chance to rebuild defences and bring up replacements, they also clearly signaled to Austria-Hungary that further operations were forthcoming, an impression enhanced both by intelligence reports indicating trains were bringing Italian replacements and supplies to the Isonzo front, and by the noise of wagons and motor vehicles behind the Italian line. Thus the opening attacks of the 4th Battle of the Isonzo today comes as no surprise to the defenders opposite. Given the onset of winter on the upper Isonzo, Cadorna's plan for this offensive is to attack along a somewhat shorter stretch of the front, with the focus of operations being at and just south of Görz. The southern wing of the Italian 2nd Army, and specifically VI Corps, is to be against Oslavija just to the northwest of Görz, and it is hoped that seizing this position will outflank the Podgora heights from the north and allow for its capture. To the south, from 3rd Army XI Corps would advance towards Mt. San Michele with three divisions while XIII Corps would attack between Heights #197 and Kote #111 in the direction of St. Martino. To both the north and south, diversionary assaults would be undertaken to pin the enemy forces opposite. 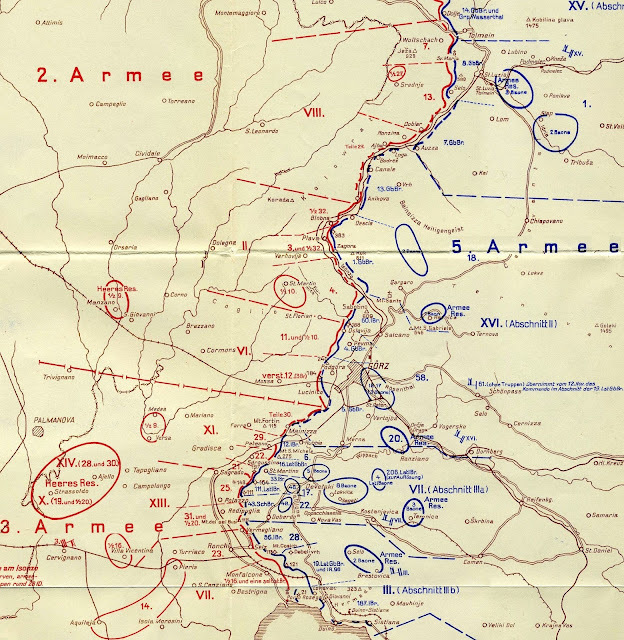 After a rainstorm early this morning delayed the start of the offensive, the Italian artillery bombardment on 2nd Army's front reaches a crescendo after 9am that lasts for four hours. The Italians attempt to maximize the effectiveness of their barrage by concentrating their fire on the specific positions that are about to be assaulted. Around 1pm the Italian infantry leap forward from their trenches and begin their attacks. North of Oslavija they reach the enemy barbed wire, and manage to bring up an artillery piece to within fifty meters to blast their way forward. However, Austro-Hungarian artillery on Mt. Santo behind the front line are able thoroughly pulverize the attacks, who shortly thereafter fall back to their starting trenches. At Oslavija itself a similar pattern plays out: the Italians cross No Man's Land, only to come under murderous artillery and machine-gun fire, and subsequently fall back. On 3rd Army's front, three hours of intensive artillery fire preceeds attacks at 11am by six divisions along the front stretching from Mt. San Michele to Mt. dei sei Busi. Only south of St. Martino are the Italians able to reach the first trench line, and counterattacks later in the day force the attackers to relinquish even these paltry gains. At 5pm a heavy storm erupts and brings the day's fighting to an end. The 4th Battle of the Isonzo, Nov. 10th to Dec. 2nd, 1915. - The Russian demonstration from Kazvin on the 7th highlighted to the German ambassador at Teheran the precariousness of his position and the Persian government if it can be convinced to side with Germany. With a sense that time is running out, Ambassador Reuss, without reference to Berlin, offers a twenty-year defensive treaty in an effort to win the commitment of the Persians before the Russians can intervene. He also suggests that the Persian government should abandon Teheran, given its proximity to Russian forces to the north, and relocate to Isfahan to the south.